Over the past few months we’ve seen the price of gold head higher. Just recently many investment analysts have predicted the price to continue its meteoric rise with $1,500/oz sited by year end and $2,000/oz within the next 18 months. Over the past decade gold has returned an average of over 25% a year. Yet, still only a small percentage of investors own physical gold, especially in the UK. Total net investment in gold from start of 2010 through to July 31st was $2.7 billion. Yet, in the course of the same period, investors poured $22 billion into emerging markets mutual funds and $155 billion into bond funds. In comparison to these numbers, the total amount invested into gold is negligible. So why are so many people ignoring the asset as part of their portfolio? I certainly don’t think it’s due to a lack of awareness of gold. The press coverage over the past few years has been phenomenal. Most people are now aware that gold can be bought as an investment, and that it performs well as a safe haven asset. So surely that’s half the job done? investors and savers still perceive gold as being elitist and out of their reach. They don’t realise that you can buy a Sovereign coin for just over £200 or tiny gold bars for £50 or less! Certainly the US retail market is at least 10 years ahead of the UK market in terms of the average person owning some gold as part of their portfolio. It’s only a matter of time before we catch up. Only a small fraction of UK investors have considered alternative assets at all. Most still stick to traditional paper assets such as stocks, bonds and cash. However, with huge losses from these assets over the past few years more people are now opening their eyes to the world of alternatives, including gold. More are now realising that a true balanced portfolio needs to include a wider range of assets. Traditional currencies such as the Dollar, Sterling and the Euro are now threatened, so we are gradually seeing more savers using gold as a store of wealth rather than leaving all their liquid assets in a Sterling savings account. But these are still in the minority, and most savers to still accept ISAs and savings accounts as the only options. The next mental block is a lack of knowledge in what to buy, how to buy gold, and where from. While gold has been around for centuries, it remains a ‘new’ asset class to many. The first question novice investors ask us is should they buy gold coins, bars or mining stocks? The options are endless and many feel they don’t know who to ask to get the answers. While awareness of gold in general is high, many of the people we speak to aren’t aware that certain coins are totally tax free in the UK, or that you can get 40% discount off the price of gold bars as part of a UK pension. That’s not a surprise when so few Independent Financial Advisers (IFAs) discuss alternative assets with their clients. 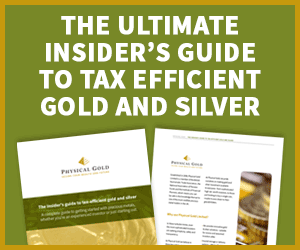 Many of the IFAs themselves weren’t aware that gold bullion could be bought with a pension. This is part of the reason why we started the Gold Adviser’s Program. When the pension parameters changed in the UK to allow some alternative investments into Self Invested Personal pensions (SIPPs), most of the press focus was on property. At the time buy-to-let properties were the thing to be in, with many modest investors becoming landlords. When residential property was widely touted to be included as permissible SIPP assets press coverage could talk of nothing else. This would mean investors could essentially buy a £100,000 flat at £60,000 once tax relief is factored in. At the last minute the Government performed a U-turn and only allowed commercial property with a SIPP. However by this stage gold had slipped under the press radar as the only commodity permitted into a SIPP. So pension gold really hasn’t been promoted in the UK. When our customers are made aware of the possibility they love the idea. It’s also true that the average investor doesn’t know the buying process. How do I pay? Where do I store the gold? How do I know it’s real. These are some of the most common questions we receive. If you have the support and expertise of a good gold dealer then these sort of questions are easily overcome. The buying process is as simple for gold as buying anything and once customers buy once they realise there is nothing radical about the investment process. Finally, it’s human nature that investors want to buy at the lowest price and sell at the highest. This is the main investment strategy afterall. So many are put off that gold is at all time highs. They feel they have missed the boat and are unsure of the best timing to add gold to their portfolio. As I mentioned at the beginning most experts feel gold has a long way to run yet and starting a relationship with a reputable gold dealer today will help you select the best buying opportunities and get the ball rolling with the new world of physical gold. This entry was posted in Blog and tagged Gold Coins, Gold Investment, Pension Gold. Will high inflation affect me? Will the gold price impact the Indian festival season?